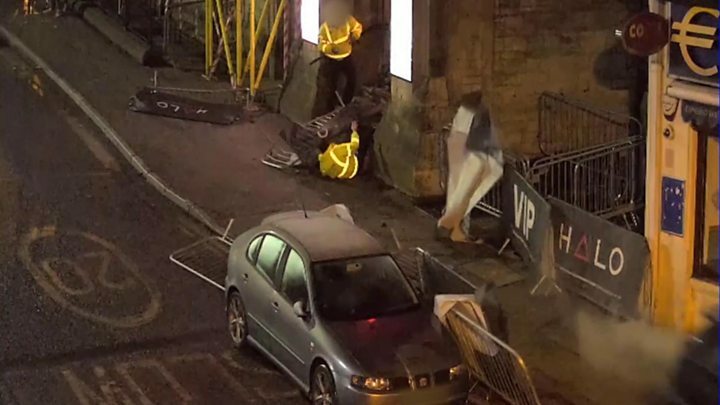 A man who smashed his car into nightclub barriers after an altercation with staff has been jailed. The head doorman at Halo nightclub in Bournemouth was injured when Shailem Dodson, 20, struck him while careering along the pavement in December 2017. Dodson was jailed for 16 months after pleading guilty to dangerous driving, drink-driving and assault by beating. He was cleared of attempted murder and attempting to cause grievous bodily harm with intent after a trial. Winchester Crown Court heard Dodson, a former soldier, punched one nightclub staff member when he had been asked to leave in the early hours of 12 December 2017. He then drove into head doorman Rafael Zanin shortly after, knocking him over and causing head and shoulder injuries. Another man was hit by a flying barrier, while a woman stood "frozen in panic" thinking she was going to die as Dodson's car careered down the pavement towards her, the court heard. Dorset Police said tests showed he had had more than twice the legal alcohol limit in his system. Janick Fielding, defending, said Dodson, of Gunville Down Road, Blandford Camp, had struggled for a long time with his mental health as well as with drink and drugs. He said the defendant, whose second child was born last week, had taken two overdoses and had twice been sectioned under the Mental Health Act following his arrest. Judge Susan Evans QC said she accepted that Dodson, had tried to "frighten" and not kill. But she said his "seriously aggressive" driving could have caused "catastrophic injuries". The judge also imposed a driving ban of three years and eight months. Det Con Laura McQueen, of Dorset Police, said it was an "absolute miracle" the doorman was not more seriously hurt. "Dodson made the reckless decision to get behind the wheel after he had been drinking," she said. "He was clearly not in a fit state to drive and his actions could have resulted in far more serious or even fatal consequences."